The 2018 Verizon Data Breach Investigations Report researched over 53K security incidents and 2,347 confirmed breaches, information provided by more than 60 contributors worldwide. Full of nefarious events by offenders both known and unknown, the 2018 DBIR will offer security pros a first-hand view into current cybercrime trends, and a map towards developing a prosperous and mature security program. Verizon assembled a panel of to discuss the findings of the 2018 VDBIR to provide the cybersecurity answers you want, straight from the experts. Cybercrime can come in any shape or size, and not always in the form you’d expect. Forget slick cybercriminals targeting billion-dollar businesses. Most attacks are opportunistic and target the unprepared. The average time gap between the first click on a phishing campaign and the first report to Security? Longer than you think. Ransomware was the top variety of malicious software in 2017. Based on our data, one industry saw 93% of their data breaches occur at the point of sale. The overwhelming majority of incidents fell into one of nine attack patterns — knowing these can help you mitigate the risks of a breach. Comtel Communications is a full-service consulting agency as well as a Verizon Platinum Preferred Partner. 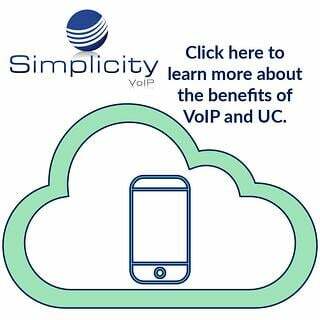 As a compliment to its business communications solutions, Simplicity VoIP offers a host of additional cloud and security technologies including Verizon solutions. Our team can help you explore the security options available to protect your business based on key priorities.